I noticed this snake a couple times alongside a pond in NY state lands not far from me, and I thought it was a copperhead. I brought my camera and made this video. The best focus on its pattern is about :40. I have been informed that the snake is actually a northern water snake, and is often confused with copperheads— which have a pinker and more saddlelike pattern. I will keep looking. Here in the boring old UK, all we have is grass snakes, adders and slow worms (a legless lizard). Still, doing the kitten thing again, I got to watch as their different instincts wire up – drop a belt or something ribbon-like on the floor, and they react like lion cubs, or other big cat babies in wildlife docs would to a snake! Two of this lot are lion cub color. Different shapes prompt different instincts. Your snake must have been basking after a meal – second loop looks quite large. How many snake varieties are their in your part of the States? Personally, I met copperheads, I do not recall snakes near ponds. However, is there any symbolism in this story? Copperheads, water snakes and a war of ideas? Copperheads were the name for pro-slavery anti-unionists living in the North in the Civil War. Wow, an online vid without a 2 minute commercial! I watched it twice just because of that. Thanks. Definitely a northern watersnake. Down south they are mostly confused with water moccasins. This time of year you are likely to see a number of them swimming in a parade within a few feet of a river or lake bank. Not a friendly snake, like, say, corn snakes or rat snakes. While not poisonous or preemptively aggressive, N. watersnakes have a rep for being quite nasty if messed with. I’ve seen a lot of them in Virginia, but have never tried to shake hands with one. There is a great web site run by Dr. David Steen where David and other snake experts resolve these What kind of snake is it? questions. He would be the best person to ask to get an expert’s view. No doubt he would appreciate seeing the vid. 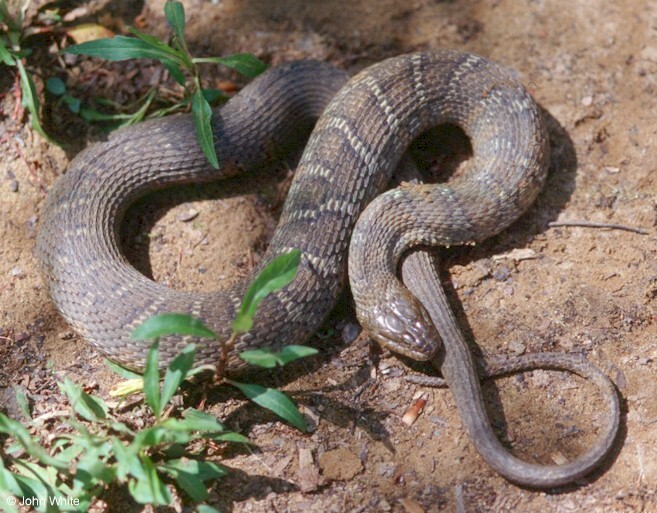 David’s site has a number of examples of N. watersnakes being confused with moccasins and copperheads. Funny you should post this. I think we must be Hudson Valley neighbors. I had one peacefully living by my house until this summer when some fool house guest claimed it attacked his dog and ‘he had to kill it’. When I looked up what it was I realized that it and the ‘Cooperheads’ some hicks had made a point of killing at swimming hole when I was kid were just harmless water snakes. Be very glad that the big snake is not a copperhead. They have a nasty venom. not really you get tagged by a copperhead and survive without treatment. most north american venomous snakes aren’t that big of threats venom wise when compared to african or asian snakes let alone sea snakes. You live in the stomping grounds of my boyhood hero Raymond L. Ditmars. No excuse for such ignorance. Cool. Phil you are my favorite ophiologist since the Henry Fonda character in The Lady Eve. Fear of reptiles, snakes in particular, is common among those raised on the story of Adam and Eve. more likely a common fear of reptiles, snakes in particular, is what originally led to their centrality in the story of adam and eve to begin with. I agree, one can easily understand our hunter-gatherer ancestor’s fear and hatred of snakes. Some african tribes consider it bad luck to kill a legavaan ,a monitor lizard,found in south africa ,because it stops the rain.if you saw them out and about or on the roads you tried to avoid running them over. One day a a woman came running up to me in panic,there was a mamba in her house,i grabbed the shotgun and followed her,it was one of those black mamba,s ,at least 2 meters long. when i got back to the house i called the betting shop for the results of the last leg of the pick six,i had already won the first 5.
i won 39,000 rand that day,used the money to leave africa. Northern water snake above often confused with..
And do not believe the reptile enthusiast who tell you coppers and cotton mouths aren’t agressive, they are. We had a boy swimming in a lake near here killed by a nest of cotton mouths years back. And I once had a cotton mouth attack my oar while canoeing down the Neuse river…stay away from them. They are aggressive indeed, with a virulent venom. If you’ve smelled ’em in the rocks, you’ll never forget it. Just like freshly cut cucumbers. No joke.